Pinkie and some of her duck friends contemplate a lovely autumn morning. Those fleeces look so thick and luxuriant at this time of year. Too bad we can’t shear now and have to wait until spring by which time the ravages of a wet winter will have taken their toll! 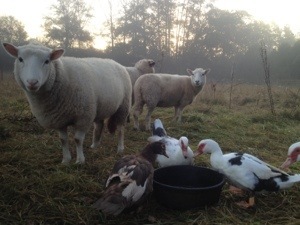 This entry was posted in Blog, Ducks, Sheep, Uncategorized. Bookmark the permalink. It’s actually a sheep-comfort reason. Those fleeces are amazing for keeping sheep warm during even the worst/wettest weather. Naked sheep would be pretty miserable around here during the winter. We also shear not too long before lambing so the ewes feel the weather and take their lambs to shelter in poor conditions. The lambs, though cute, don’t have much woolly protection when they arrive and ewes, still wearing their heavy winter coats, don’t pay too much attention to spring showers.